詹博文, 孙凌玉, 黄彬城, 等. 车用复合材料螺旋弹簧的设计与优化[J]. 北京航空航天大学学报, 2018, 44(7): 1520-1527. ZHAN B W, SUN L Y, HUANG B C, et al. 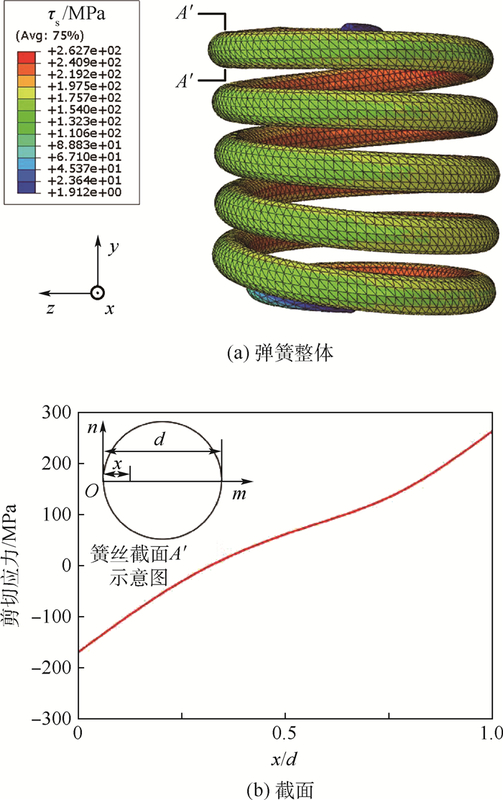 Design and optimization of automotive composite helical spring[J]. Journal of Beijing University of Aeronautics and Astronsutics, 2018, 44(7): 1520-1527. Abstract: A major problem in designing automotive structures is how to make full use of the flexible designability of composites and light weight of polymer matrix, and also consider the close connection among the material, structure and properties. Since the helical spring is one of the major load-bearing parts of suspension and subjected to complex loads, it is generally manufactured by spring steel with ultra-high performance. If replaced by lightweight composites, both safety and light weight should be satisfied, which makes the design of composite helical spring rather difficult. In this paper, an integrated materials-structure-performance design method of composite helical spring is proposed. According to the stress distribution on the cross section of spring under compression, carbon fiber reinforce polymer (CFRP) material with ±45° ply sequence is selected. 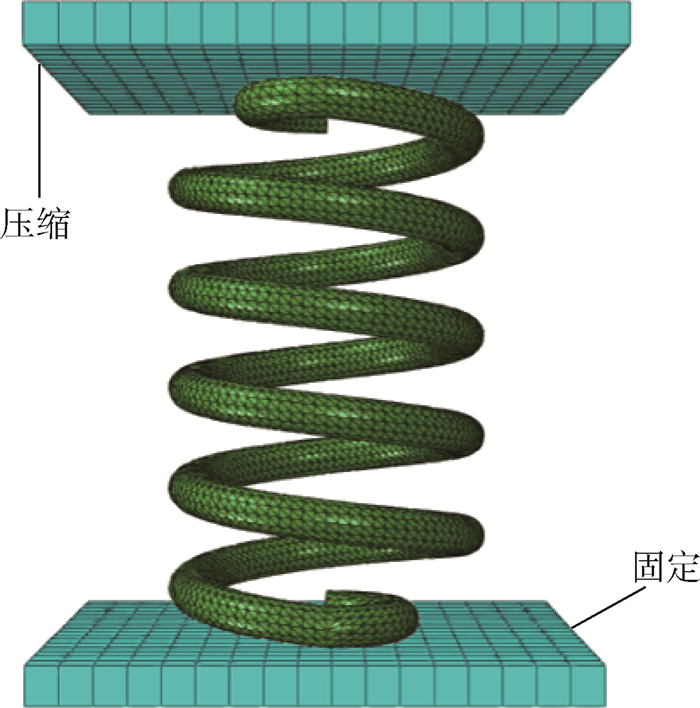 Under the constraint conditions of stiffness, strength and installation space, the initial geometric parameters of helical spring are derived by analytical models based on spring stiffness and strength and composite material mechanics. Furthermore, the initial result is verified numerically by finite element simulation. 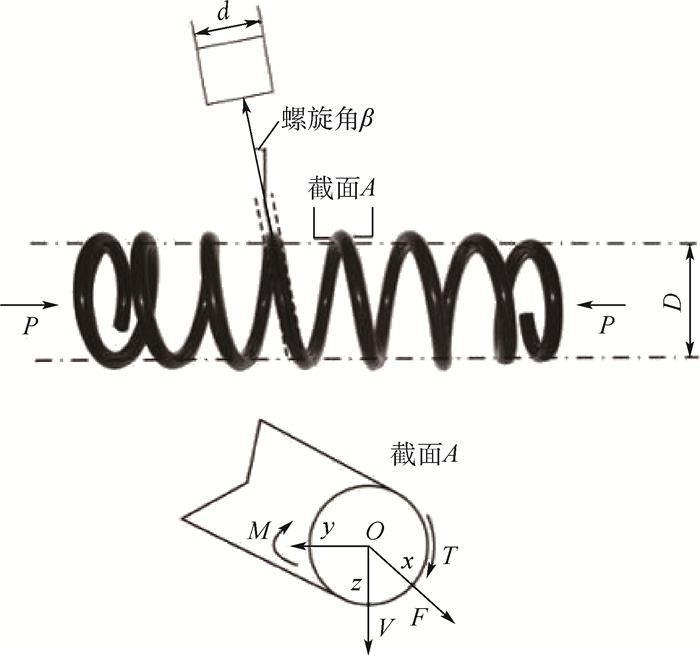 Combining the design of orthogonal experiment with numerical simulation, the response surface model of stiffness and strength of helical spring to its geometric parameters is established. Finally, the optimal design of helical spring satisfying both required performance and weight reduction is obtained by genetic optimization algorithm. Compared with the metal helical spring, the CFRP one reduces the mass by 34.4%. As a representative product development case, it has demonstrated that the proposed method is a feasible integrated solution for design of automotive structural components with composite materials. 张靠民, 李敏, 顾轶卓, 等. 先进复合材料从飞机转向汽车应用的关键技术[J]. 中国材料进展, 2013, 32	(11): 685–695. BUDAN D A, MANJUNATHA T S. Investigation on the feasibility of composite coil spring for automotive applications[J]. World Academy of Science Engineering & Technology, 2010, 4	(10): 1035–1039. SEQUEIRA A A, SINGH R K, SHETTI G K. Comparative analysis of helical steel springs with composite springs using finite element method[J]. Journal of Mechanical Engineering and Automation, 2016, 6	(5A): 63–70. OH S H, CHOI B L. A determination of design parameters for application of composite coil spring in a passenger vehicle[J]. Journal of the Korean Society of Manufacturing Process Engineers, 2013, 12	(1): 77–83. 宁方飞, 刘晓嘉. 一种新的响应面模型及其在轴流压气机叶型气动优化中的应用[J]. 航空学报, 2007, 28	(4): 813–820. ARORA V K, BHUSHAN G, AGGARWAL M L. Enhancement of fatigue life of multi-leaf spring by parameter optimization using RSM[J]. Journal of the Brazilian Society of Mechanical Sciences & Engineering, 2017, 39	(4): 1333–1349. 杨永宝, 金达锋, 高希. CFRP圆柱螺旋弹簧静刚度预测理论及仿真[J]. 汽车技术, 2013	(7): 21–25. 朱建辉, 曾建江, 陈滨琦, 等. 复合材料层合板压缩载荷下渐进损伤分析与试验验证[J]. 机械科学与技术, 2015, 34	(5): 785–789. 沈观林, 胡更开, 刘彬. 复合材料力学[M]. 北京: 清华大学出版社, 2013: 231-237. 时培成, 龚建成. 汽车悬架变刚度螺旋弹簧最优化设计[J]. 现代制造工程, 2006	(11): 112–114. 徐小力, 徐洪安, 王少红. 旋转机械的遗传算法优化神经网络预测模型[J]. 机械工程学报, 2003, 39	(2): 140–144.